These meatballs are easy to prepare and are a fabulous party food. Stir the first nine ingredients in a large bowl until blended. Add ground venison and mix thoroughly. Form mixture into 3/4 inch diameter meatballs. Pour enough oil into a large, heavy skillet to completely coat the bottom. Warm over medium-low heat. 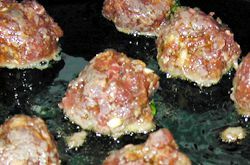 Working in batches, roll meatballs into the skillet and fry until brown and cooked through, about 5-6 minutes per batch. 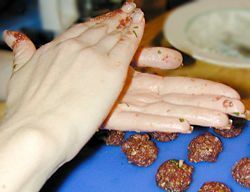 Rolling the meatballs into the frying oil (rather than just plopping them in) coats them completely and helps to prevent sticking. Be sure to turn meatballs frequently to ensure even cooking. Drain on paper towels and transfer to a serving bowl. Repeat step 2 until all of the meatballs are cooked, adding more oil to the frying pan as necessary. 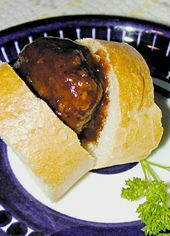 Serve in a large serving bowl or crockpot in Spicy Chipotle BBQ Sauce, or your favorite BBQ sauce. Friends who hunt are also an excellent source for wild game. Most that I know have a freezer full of different varieties and are usually more than happy to contribute some in exchange for a deluxe meal. Still no luck? Never fear. Ground beef can be used as a substitute, if venison is unavailable. This entry was posted on Thursday, September 6th, 2007 at 6:01 am	and is filed under Appetizers, Carnivore, Main Dishes, Master Recipe Index, Party Food & Snacks. You can follow any responses to this entry through the RSS 2.0 feed. You can leave a response, or trackback from your own site.